A potentially perfect semi-modular 775 watt PSU that's 80Plus bronze certified and SLI-ready, so what's the catch? Clearly aimed at gaming and high-end desktops, the Thermaltake Toughpower XT 775W comes with both Nvidia SLI and ATI CrossFire certification. It can happily deliver power to a wide range of system components including mid- to high-performance PCI Express graphics cards. Under load, the Thermaltake Toughpower XT 775W achieved 100 per cent of the manufacturer's claimed performance based on 12 volt rail real-world scenarios. In terms of total efficiency, the Thermaltake Toughpower XT 775W lagged behind other mid-range power supplies like the XFX ATX 850 Black and the Cooler Master Silent Pro Gold 800W. However, it gave decent performance in terms of standby efficiency; keeping up with the pack for similar performers in its class. Under load, the PSU produced slightly less decibel noise compared to similar power supplies, however it was no match for the 800W Cooler Master. The fan performed well, venting enough heat to keep the PC cooler on the inside than the exhaust, but the output cables were pretty warm to the touch during high-load testing. The tested rails were all within the ATX specified tolerances and the Thermaltake Toughpower XT 775W produced a steady voltage reading at 75 per cent load, making a near flat line showing less electrical interference. In terms of appearance, the PSU has a military olive green casing, which integrates with the fan grate to form one solid unit, and a honeycomb-patterned grate at the rear helps vent excess heat. The build quality of the Thermaltake Toughpower XT 775W is very rugged, while it's ever so slightly bigger than the average-sized PSU with dimensions of 180 x 86 x 150mm. 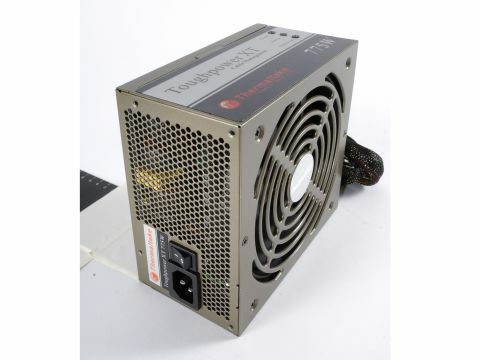 Despite the additional size, the Thermaltake Toughpower XT 775W is not a particularly heavy PSU, weighing in at 1.939kg and the manufacturer's stated AC power input is 115-240V 12A 50\60Hz. The Thermaltake Toughpower XT 775W comes with a total of 29 output connectors; 1x ATX 20/24-pin connector, 1x CPU 4+4-pin connector, 4x PCI Express 6/8-pin connectors, 2x PCI Express 6-pin connectors,12x SATA connectors,8x 4-pin peripheral (MOLEX) connectors and 1x floppy connector. Despite an overall good performance for the PSU it didn't give a consistent performance across all tested areas within the review, falling behind the best in the test.